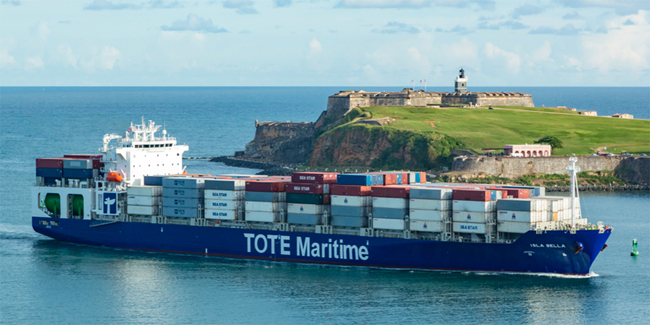 TOTE Maritime’s Isla Bella is one of four newly built U.S.-flag vessels dedicated to the Puerto Rican Jones Act trade. Released on July 18, the 28-page study, entitled “The Impact of the Jones Act on Puerto Rico,” was the product of Reeve & Associates of Boston and Estudios Tecnicos, Inc. from San Juan. The economists looked at previous studies – including one from 2012 by University of San Juan economists that was highly critical of the Jones Act and another conducted in 2013 by the U.S. Government Accountability Office – to compare what they found in their research. Among the results was an “apples-to-apples” comparison of prices for identical items found in the grocery section of Walmart stores in Jacksonville, FL (chosen because many of the goods shipped from the mainland United States to Puerto Rico come from this port) and San Juan in March 2018. In many cases, prices were identical – and in some instances, the price paid by a Puerto Rican consumer was lower than those paid in Florida. Among the examples offered by the study of consumers paying the identical prices were Dinty Moore beef stew, Uncle Ben’s long grain rice, Crisco canola cooking oil and Quaker oatmeal breakfast squares. The researchers found prices in Puerto Rico lower for Nescafe instant coffee, Great Value boneless skinless chicken breasts, and a dozen AA Eggland’s Best eggs. Prices for durable goods also were compared, showing identical televisions, refrigerators and mattresses carried the same prices in both locales. It debunked claims made in previous studies that the Jones Act has a negative impact on Puerto Rico’s economy. It stated businesses try to keep inventories low because these firms have to pay taxes on what they have stored. The cost of such taxes are passed along to consumers with no connection at all as to whether the goods arrived aboard U.S.-flag vessels or foreign-flag ships. In fact, the new study showed that more than half of all vessel calls to the commonwealth (57 percent) in 2016 were by foreign-flag ships, deflating the argument that the Jones Act impedes access to the island by non-U.S. bottoms. The study praised the efforts of the U.S.-flag companies who have worked continuously to rebuild Puerto Rico since the storm. As was demonstrated during the MTD Executive Board meeting in March, these companies diverted vessels, tugs and barges to increase the number of sailings to bring badly needed goods to the commonwealth. Just as the MTD Executive Board also heard in March, the study revealed how U.S.-flag companies – TOTE Maritime and Crowley – each recently have built two state-of-the-art containerships to handle the Puerto Rican trade. The study did note that a recent decrease in containers arriving in Puerto Rico is related to the downturn in the island’s economy and its shrinking (prior to the hurricane) population. It showed that container volume was down for both the Jones Act-trade and foreign trade. “This report validates many of the facts we have been stating about the importance and value of the Jones Act,” MTD President Michael Sacco pronounced. “Now we have good, solid figures to go along with what we’ve seen with our own eyes and delivered with our own arms. “The Jones Act continues to serve all Americans,” Sacco concluded. Reeve & Associate is a management consulting firm that has dedicated itself to serving clients in domestic and international shipping and logistics. Estudious Tecnicos, Inc. is a 32-year-old consulting firm that is a leading provider of economic analysis as well as disaster preparedness, management and recovery-related consulting services.